MANP hosts the only job board in Maine exclusively for nonprofit and philanthropic employment opportunities. Payments for job postings are due at the time of the order. Visit our Member Directory and Friend Directory if you’re unsure of your organization’s status. To post a job, complete our online form. You will be asked to log in to your MANP Online account before completing the form. If you do not have a MANP Online username and password, you will need to create one before being able to post a job for your organization. Job listings will be reviewed by MANP staff and appear on the Job Board within 1 business day. Organizations cannot post jobs on behalf of other organizations. Postings must be for paying jobs. No unpaid positions will be posted. Jobs must relate to the nonprofit sector. MANP provides many professional development opportunities that can help job seekers build skills and make valuable connections. Visit the Learn section of our site to find and register for upcoming trainings, or to browse online resources. Volunteering can be another excellent way to develop new skills and build connections with nonprofit organizations and staff. 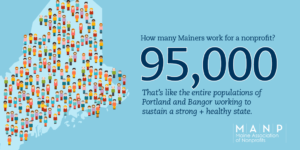 Visit VolunteerMaine to browse volunteer opportunities. No dedicated HR staff? An affordable way to fill the gap. Build skills and expand your professional networks. Take the guesswork out of what to pay your next hire.